Marisol Castellan is in trouble-again. Against her pirate father's orders, she snuck off their ship to intercept a message meant for a rival captain, one that offers a clue to the whereabouts of her estranged brother Monte. An interesting start where Marisol Castellan literally falls at the feel of Captain Blade Tyburn and from there the story starts. Marisol is on a quest to search for her missing brother Monte and she's got the clue to his whereabouts when she intercepts a message meant for Blade. And she's stolen his cameo and Blade sets off to reclaim what is his and found themselves drawn to each other. Through the treachery and deceit, who will Marisol choose-- family or Blade? Characters are realistic. I find myself drawn to Marisol's personalities and her uncanny ability to attract troubles wherever she goes. She's brave, strong and loyal AND a remarkable marksman with her dagger (she's dangerous with it!). You should read how she uses them! Blade is a man with a dark past that he couldn't get out of. Will Marisol wipe it off for him? 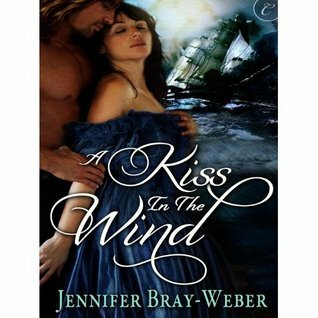 A Kiss in the Wind is an enjoyable read with a good plot. You'll be surprised by how the story turns out! 4/5 Stars for A Kiss in the Wind.